One of our longtime VPC members (and ink connoisseur), Glenn Marcus, emailed me this photo of an ink he just purchased in Paris while on vacation---the new Caran d'Ache Chromatics INKredible Colours ink in Magnetic Blue. 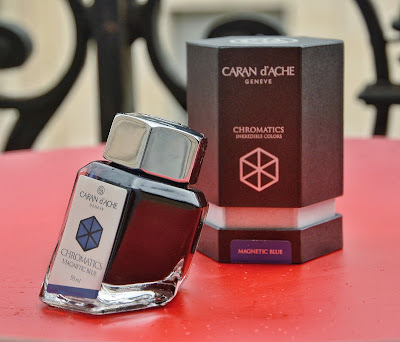 According to their website, the Caran d'Ache Chromatics line is "a new collection of ink bottles with 12 colours inspired by the prism. The new Caran d’Ache ink bottles synthesize a unique expertise: the science of colours. Named Chromatics INKredible Colours, the collection uses Caran d’Ache’s colour experience to master the most intense pigments across a spectrum of 12 vibrant, deep shades. From ultramarine blue to luxuriant green, from shimmering orange to passionate red, they give the words a soul and the text a uniquely vibrant style."